Home » How to make homemade window cleaner! 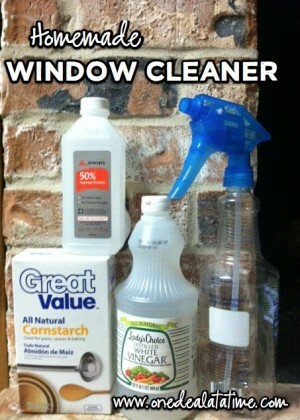 How to make homemade window cleaner! August 20, 2016 By Tiffany 18 Comments By clicking on our links, we might make a SMALL commission - Thanks for the support! See our full DISCLOSURE here. When we were kids, my Mom would have us fill a bucket with warm water and a little Dove dish soap and was the outside windows of the house. It always left them clear and without streaks. The price of Windex has really gone up quite a bit, to almost $3.50 a bottle at Walmart. Even with a coupon it is really still overpriced in my opinion. Plus, if my kids clean a window with it, they use almost 1/2 a bottle! I am also trying to cut down on the amount of waste that we generate in general, and I love the idea of a very natural and safe cleaner that my kids will be around. The total cost is around $.10 a bottle of cleaner for the homemade. That is a HUGE savings over a year, it is much more “green” and safer for the kids! The only other variation, is if you used a little tiny bit of dish soap. This is the one that my Mom uses, I change it up a bit and use mine above, about every other time! I use half water to half vinegar in water bottle. My house is mostly marble and glass. For potty’s I use baking soda and vinegar . At first my sisters would complain about my house smelling like vinegar but now they ask where’s my vinegar spray? I have lots of allergies to products so this works for me, and vinegar kills germs well atleast I think so. Lol. I too use 1:1 water and vinegar. It is safe, cheap and easy. I use vinegar for EVERYTHING….and yes. It does kill germs. There was a university study done ( don’t have the link …but I’m sure you can google it!) that proves it does kill better then some commercial cleaners. I also have found warm vinegar and original blue dawn work AMAZINGLY on bathtubs and tiles!! 1:1 ratio as well! Spray….let dry, wet…wipe…rinse…SPARKLING! To Maryanne, is that just 1:1 with the dawn and vinegar. Trying to find any easy way to clean the tub since it is hard to reach across to clean! TY! For inside mirrors etc I use about half vinegar and half water. For outside windows I use a couple of drops of sunlight dish soap in a pail of water…. Trick is to dry the window completely with plain white packing paper. I have a friend who cleans new construction multi-family apartments for a living. I went to work with her for awhile and was astonished that she just uses about 4 drops of Dawn dish soap in a bucket of water. She uses a cloth and covers the window and then a Squeegee. I was impressed that it works well and quickly! Don’t be afraid to use newspaper for cleaning (drying) windows. It really does work, incredibly. Try it once – you’ll be amazed! I just bought a bottle of off brand windex at Aldi’s for 89 cents. Figured it was worth a try. The recipe with cornstarch leaves a streaky mess. I am going to try the other recipe you suggest. Straight Hydrogen Peroxide in a dark spray bottle is amazing! I had a natural cleaning company cleaning my house after my daughter was born and it’s perfect. They used a squeegee – I used paper towels. Either work great. Ecloths are fantastic for cleaning at home as well. Each one has a certain use and they do not harbor germs. They use just hot water to activate. I clean houses and have used 2Tb of white vinegar in a spray bottle filled with water. I find that cottonrags work better than paper towel and leave leass dust behind. They are also reuseable. Lately, I have been noticing streaking on mirrors and glass shower doors which never used to happen. I am very sensitive to sents so cannot use the ammonia and alcohol. I make my own cleaners and detergents as well for financial reasons. I just wanted to say neither ammonia nor alcohol are safe for children! Just because they are natural, does not mean you don’t have to worry about ingestion or keeping the products you create locked up. Mean only as a reminder to people – natural does not mean safe! I make my own cleaners and detergents as well for financial reasons. I just wanted to say neither ammonia nor alcohol are safe for children! Just because they are natural, does not mean you don’t have to worry about ingestion or keeping the products you create locked up. Meant only as a reminder to people – natural does not mean safe and you still have to be mindful of the kiddos! you can even skip the corn starch. My mom use these ingredients and so have I for many years. works great!!! When cleaning widows on the outside, a long handled squeegee is the only way to go. (It’s kind of messy, though not impossible, to use one inside.) Slosh on generous amounts of water containing a small amount of dish liquid and work quickly from top to bottom. Whatever method or product you choose, a cloudy and not too hot day is your best time to clean windows. Another tip: Work top to bottom on the outside and side to side on the inside. That way you know where the inevitable streaks are.